Marc Crose was born on December 13,1962 in Tulsa, Oklahoma. Between the ages of 10 and 15, he moved from Oklahoma to Salt Lake City Utah, Denver Colorado, Newburry Park California, and Ventura California. Although he grew up in a Christian home, he formally accepted Jesus Christ as his Savior at the age of 22. His favorite chapter in the Bible is I Corinthians 13. 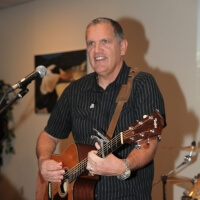 Marc enjoys leading worship at PRCC. His love for God and praising Him shines through in worship and song. His humbled heart and passion for serving God and others is clearly evident. Marc met his wife, Tawni, at PRCC and they have been married for 14 years. He has four kids – a 25-year old daughter, a 24-year old son, a 16-year old son and a 12-year old daughter. On his days off, he loves to go to the beach with his family.